As this Thanksgiving weekend comes to an end, we'd like to share a photograph from last year's festivities. It would be Anuj's last Thanksgiving with us. He was back in the Bay Area from Philadelphia for a few days. Given his very busy schedule, Anuj didn't lead the kitchen activities. Instead he supervised Kapil as he tried to cook up a few of Anuj's specialties. We've already talked about what an incredibly gifted teacher Anuj was and this time was no exception. Under his watchful eye, and easy-going yet insightful guidance, Kapil produced a delicious meal for everyone. The reason why these photographs went from a few quick digital snapshots to cherished treasures in a few months leaves a cratering hollow in our chests. 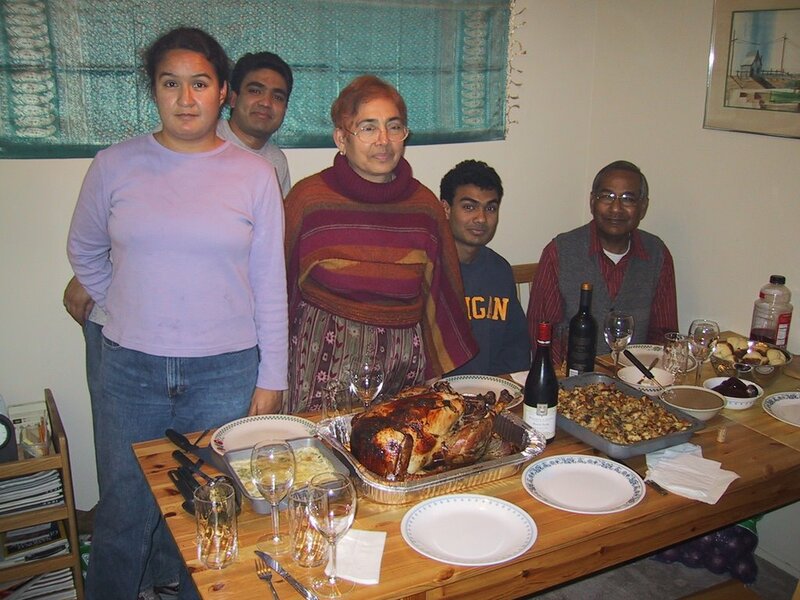 However we believe that by teaching us how to cook instead of doing it himself on his last Thanksgiving, Anuj made sure that a part of him will always be with us on this holiday. Anuj hanging out in Mom and Dad's kitchen. Kapil is pulling out the turkey from the oven. Fall 2005. 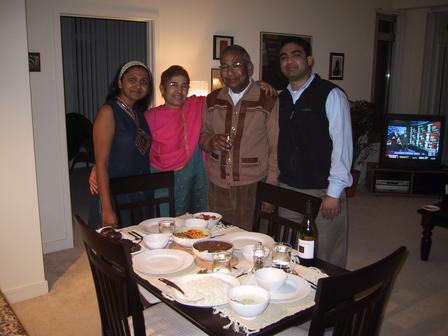 In early November 2004, Anuj called his family to let them know that he would have to travel to Bangalore, India on business, and would therefore not be in town on Thanksgiving day. 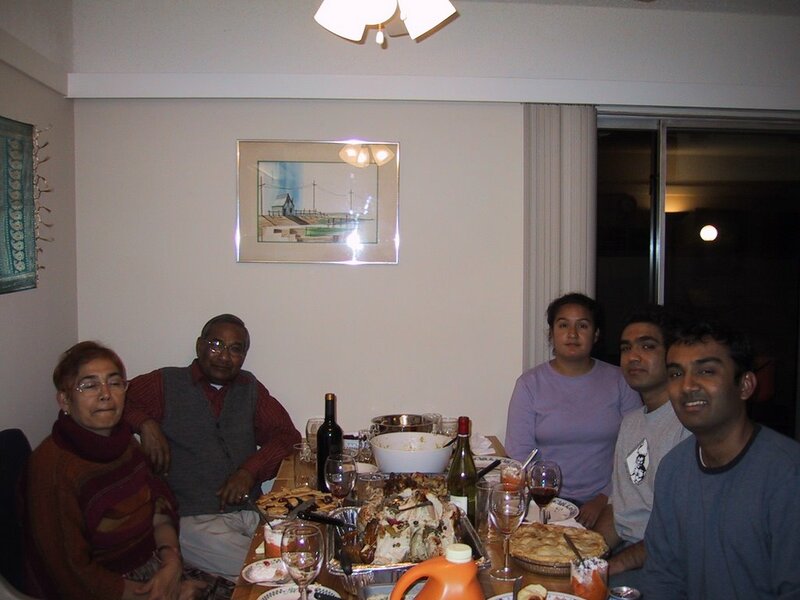 The Mohan clan loved gathering for Anuj's Thanksgiving feasts, which consisted of succulent turkey, several different types of stuffing, apple and cherry pies made from scratch, and other amazing concoctions he and Flo would labor for hours and hours in the kitchen to create. 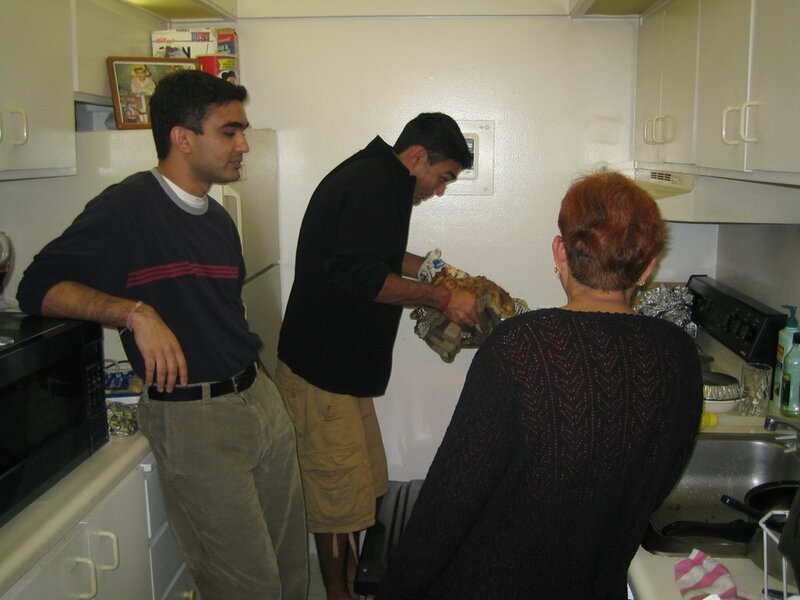 Never being one to disappoint, Anuj proposed a plan B--he would whip up an authentic Thanksgiving meal with all of the trimmings before leaving for India. True to his word, the weekend before Thanksgiving Thursday, he invited the Mohan clan and a few of his friends to his parents' home where he and Flo prepared an extraordinary meal while poring over flour-laced pages from several cookbooks, buttering pans of every shape and size, and keeping everyone's wine glasses full while we awaited the mouth-watering meal ahead. The stuffing had tart green apples and raisins. The turkey was lovingly basted and cooked to perfection. There was a well executed salad, which Anuj was self-deprecating about because he felt it contained too much parsley. For dessert, there were scrumptious pies of every variety. At the end of the evening, Anuj sent everyone home with a few goodies, which we relished for days. Kapil attentively observed Anuj's meticulous cooking process. Last year, he and Mom replicated many of the elements of our 2004 meal. 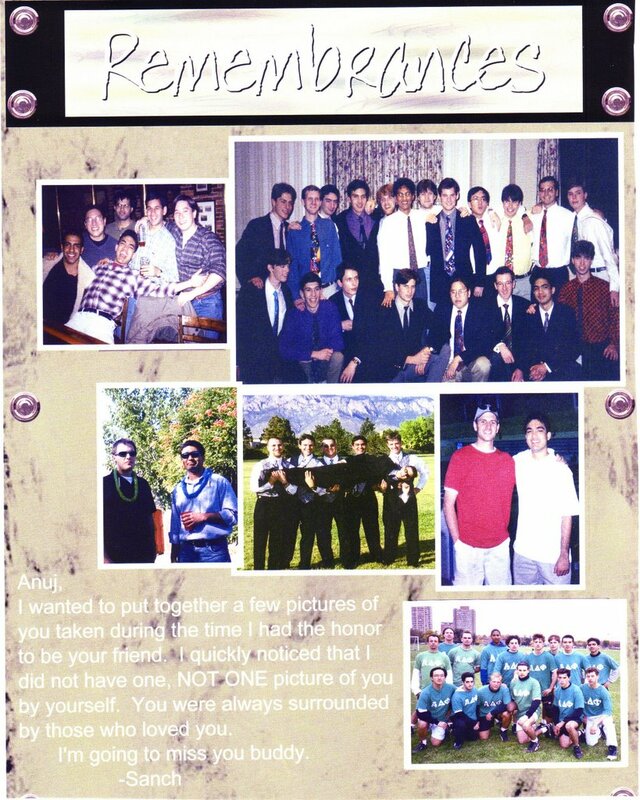 While we remember Anuj fondly every hour of every day, Thanksgiving in particular brings back a flood of memories. This is because Anuj was simply the center of this holiday for the Mohan family. Every Thanksgiving, for the last several years, Anuj got up early in the morning to pick out all the ingredients for a traditional turkey dinner. For the next several hours, sometimes with the help of family and friends, most notably his kid brother Kapil, Anuj would take over the kitchen and masterfully cook up the entire feast from scratch. In addition to the perfectly moist turkey filled with his signature savory stuffing, there would be several sides, from a couple of types of potatoes to an assortment of vegetable dishes. To cap off the sumptuous meal, Anuj would bake a variety of pies, making even the crusts from raw ingredients, so that we could have our pick of fresh berry and fruit flavors. Thanksgiving at Mom and Dad's. Some of Anuj's creations are on display. Fall 2003. The food was delicious. But, of course, the day wasn't only about the food. Perhaps more importantly it involved spending time together, watching a little football and sharing old stories. Even though he was busy cooking, Anuj was an integral part of all of this as well. And that is why we miss him so much today. Anuj, we have to believe you are with us on this Thanksgiving because without you, the holiday is meaningless. All smiles after Thanksgiving dinner. Fall 2003. "Anuj, I wanted to put together a few pictures of you taken during the time I had the honor to be your friend. I quickly noticed that I did not have one, NOT ONE, picture of you by yourself. You were always surrounded by those who loved you." 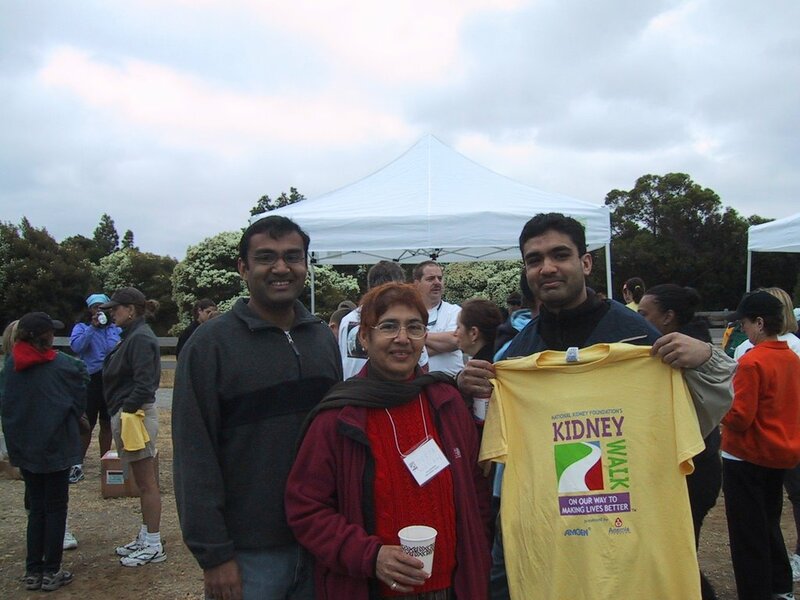 "thank you for all that you did for me"
Anuj took part in his first Kidney Walk, we believe he found it to be a fun activity that was also an effective way to raise money for a great cause - The National Kidney Foundation. The next year, instead of just participating, Anuj decided that he would play a leadership role in organizing the annual event. 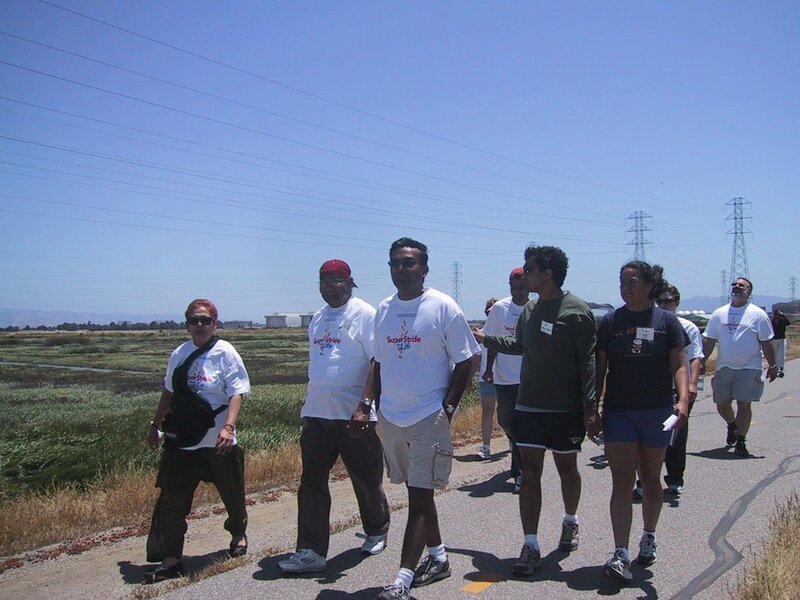 For several weeks before the 2005 Walk, Anuj would drive 40 miles from San Leandro to San Jose early on Saturday mornings to plan the event with fellow volunteer leaders and Kidney Foundation staff. 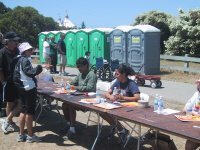 Checking participants in and raising money before the Kidney Walk. Spring 2005. On the morning of the Kidney Walk, by the time the rest of the Mohan family arrived, Anuj was already at Shoreline Park in Mountain View manning the registration desk and generally making sure that the event progressed smoothly. He made new friends, joked with family, and took part in the walk, all the while with one eye focused on the logistics of the fundraiser. Afterwards, he stayed behind to help his fellow volunteers clean up and reflect upon an effort that raised tens of thousands of dollars for families afflicted with kidney disease all over the Bay Area. Anuj didn't volunteer for these types of efforts out of a sense of duty. Obligation is only a motivating factor when one feels that the endeavor is arduous in some way. To Anuj, helping people was never arduous, but rather simply the way he lived his life. He just enjoyed, and derived a sense of fulfillment from, going out of his way for others. It was this outlook that allowed Anuj to make such an indelible impact on those around him despite his short time on this earth. We can only imagine how he would have channeled this passion for helping those in need if he was blessed with more years with us. Among the various charitable causes and community organizations Anuj was involved with, one had particular significance - The National Kidney Foundation. When his father was diagnosed with severe kidney disease in 2002, a condition that would eventually require a transplant, Anuj put forth a herculean effort to ensure that he received the best healthcare possible. As some friends and family know, Anuj essentially saved his father's life by negotiating the labyrinth of governmental and medical organizations in India and the US to make sure that a transplant would eventually be possible. The story of Anuj's energy, ingenuity and persistence in this effort is the stuff of multi-generational family legend and will be shared on this blog at a later date. Given Dad's kidney disease, Anuj thought about finding a way to help others while he was helping his family. The National Kidney Foundation seemed to be the perfect vehicle for this. The Foundation is a national voluntary health organization seeking to prevent kidney and urinary tract diseases, improve the health and well-being of individuals and families affected by these diseases, and increase the availability of all organs for transplantation. The Kidney Walk is one of the most important events put on every year by community chapters of the Foundation. It is a way for families touched by kidney disease to spend time with each other and their supporters while raising money through a walk. As in other charity walks, participants gather contributions from their friends, family and colleagues leading up to the event. In fact the walk is the primary fund-raising vehicle and thus critical to supporting the organization's mission. 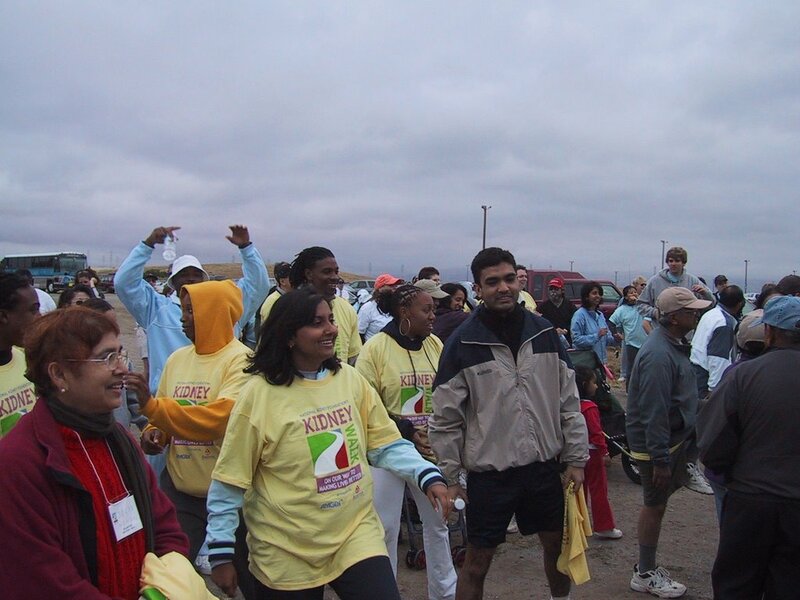 In 2004, the Mohan family took part in the Kidney Walk, walking as well as logistically supporting the event that took place at Shoreline Park in Mountain View. The day consisted of breakfast, Tai Chi, and of course, the actual walk. Thousands of dollars were raised along with the spirits of the participating families. Anuj, displaying his penchant for leadership and desire to go the extra mile to help others, decided that just participating in these events was not enough. The next year, he would play a more active role. We will describe this in our next post. "Please don't ask if I'm over it yet. Please don't tell me he's in a better place. His isn't here with me. Please don't ask me if I feel better. Please don't tell me at least you had him for so many years. Please don't tell me God never gives us more than we can bear. Please just say you're sorry. Please just say you remember my child, if you do. Please mention my child's name. Please just let me cry." 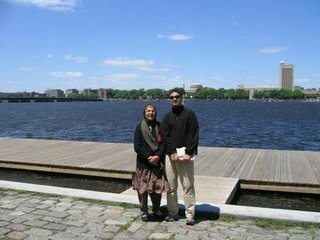 Mom and Anuj. Spring 2004. "A good leader inspires people to have confidence in the leader, a great leader inspires people to have confidence in themselves." On this day when so many people, from political junkies to casual observers, are focused on changes in Washington DC, our thoughts naturally turned to what all these events are fundamentally about - leadership. So many of those in the public arena today embody the boisterous, combative, egocentric style of leadership. As his friends tell us over and over, Anuj was just the opposite. He was a true leader because he led by example. Anuj focused not on himself but rather on ensuring that those around him realized their true potential. He believed in people and made sure they knew that. This gave them the confidence to succeed, thereby allowing Anuj to calmly and quietly lead them to accomplish the goal at hand, whether it was small or large. 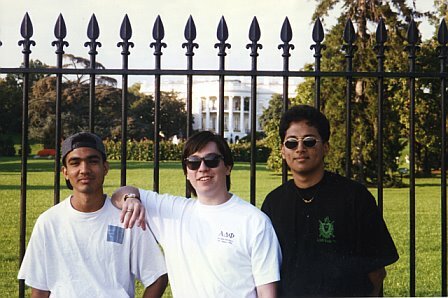 Anuj in front of the White House during a college roadtrip to Washington DC. During the mid-nineties. Given the innumerable stories related to us about Anuj's leadership, we suspect this will be just the first of many posts on this subject. Along with all his other interests, Anuj was a big news junkie. No matter how busy he was, Anuj always found a way to stay well-versed in the day's current events from all corners of the world. When it came to a discussion of the political, cultural or economic zeitgeist, his friends and family knew that they could always find an informed and thoughtful partner in Anuj. Before dinner on election night. Fall 2004. Since Anuj shared this interest with other members of the Mohan family, election season resulted in many spirited discussions and debates. Instead of taking a black and white, Democratic or Republican, stand like many are inclined to do, Anuj could be counted on to offer a more nuanced position on the issues. That is what made discussing politics with him so interesting. Anuj invariably managed to offer an insight not put forward in newspaper op-eds or political blogs. He would quietly and systematically lay out his argument for why his vote would go a certain way. After that he made sure to listen carefully to opposing opinions and offer rebuttal only after thoughtfully considering those views. And just as importantly, unlike many engaged in public debate today, he refrained from offering empty or regurgitated commentary on issues he had not formulated a clear opinion on. Maybe it was all those years of leading his winning debate team in high school. Whatever the reason, Anuj brought an original perspective to any conversation on current events especially during an election. The last major election we shared with him was 2004. Anuj came by after voting and we watched the presidential and congressional election results unfold throughout the evening together. We joked about the political gaffes committed by the main contenders, shared differing opinions on the candidates' political strategies, and generally had a good time over dinner flipping between the various networks and cable news channels for hours. This year, in the current heated election season, we miss Anuj's measured discourse, amusing observances, and willingness to always hear another view. "We Hold Anuj as an Ideal"
Thanks to our partners at Silicon Valley Community Foundation, the Bay Area foundation that is helping manage the Anuj Mohan Scholarship Fund, we have now added online donation as an option to those who would like to support this cause. 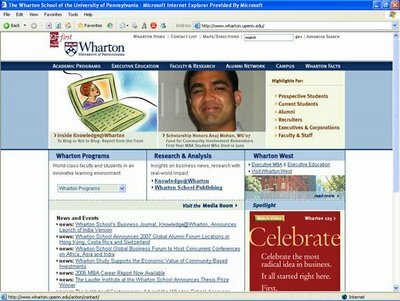 As mentioned before, the scholarship fund aims to provide deserving students from underprivileged families the opportunity to attend MIT and Wharton. Providing equal access to life-changing educational opportunities was very important to Anuj and our goal is to continue his legacy into perpetuity. Silicon Valley Community Foundation has made the process of online donation very easy. Simply click on the button under "Donate Online" in the Anuj Mohan Scholarship Fund section along the right-hand column of this blog. 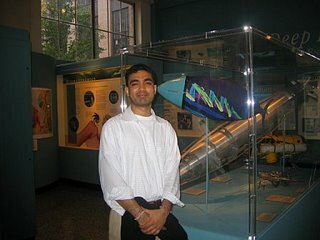 This will take you to a page hosted on the Silicon Valley Community Foundation website about Anuj's life and the scholarship fund. Near the top of this page is another link to the PayPal-powered online donation page. 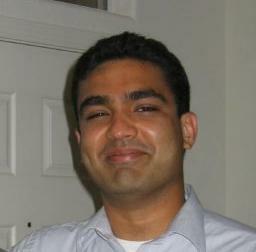 Simply fill out the form as instructed - indicating the Anuj Mohan Scholarship Fund in the "Payment For" box. Thank you again to our family and friends from around the world for their continuing support of our efforts to honor Anuj and help talented kids in his name for many years to come. Anuj on a trip to Boston. Summer 2004.